Who doesn’t love soup? Especially during the colder months. Sure, some of them, thick and hearty after hours of gentle simmering, can be a meal in a bowl. But not all of them need take such extended preparation. Leek and potato soup is wonderfully comforting on a cold day, and only takes about 30 minutes to make from scratch, using simple ingredients that take little time to prepare. This one recipe can also be served in a variety of ways depending on whether you want a quick warming mug for lunch, or serve a striking and surprisingly economical special occasion starter. Texture: Use of floury potatoes means this soup will puree to a wonderfully smooth and velvety texture. Nevertheless, I do like to have a little texture for visual as well as gustatory variety, so I hold back some of the cooked, cubed potato to add as a garnish. Flavour: The soup is only simmered for a brief 20 minutes and this mellows the flavour of the leek. To lift the flavour, I like to briefly cook a little chopped leek in sme butter and then either stir into the whole just before serving, or just spoon over the top of the cubed potatoes. Visual Appeal: The photographs don’t really reflect it, but this soup is a beautifully pale green colour. It really makes the buttered leeks (if you’re using them) pop. If you aren’t inclined to ‘faff’ buttering some leeks, you could always snip a few dark green chives into the bowls to serve. Garnish: Grated cheese and/or bacon bits are especially fine. My daughter recently declared this her favourite soup, even ahead of tomato soup. She likes it best with a melty cheese toastie cut into fingers to dip in. This is her helpfully holding a spoonful of delicious soup garnished with potato cubes and buttered leeks. Unfortunately, what she’s not so keen on is any of the things I thought added so much to the presentation, i.e. the aforementioned buttered leeks and potato cubes. So after this picture was taken, I just put everything back into the blender and whizzed it smooth and she was happy. The buttered leeks still add their pop of flavour, just with none of that pesky texture. Peel and dice potatoes into cubes – about 1.5cm. Remove the outer leaves of the leek and shred finely using a mandolin or with a sharp knife. If you’re going to butter some of the leeeks, set aside 4-5 spoonfuls. Melt the first lot of butter in saucepan and add the potato cubes and leek. Stir over medium heat until the until leeks soften. Add the milk, water and bouillon. Cover and simmer gently until the potatoes are cooked (20 mins-ish). While the soup is cooking, melt the remaining butter in a pan and cook the remaining leeks. When the potatoes are cooked, remove about a cupful and keep warm. Puree the remainder, either using a stick blender or liquidiser. Return to the pan and taste. Season using ground white pepper and salt. Heat well before serving, but don’t let it boil. NB You may need to thin the pureed soup if the potatoes are especially starchy. It should have the consistency of double cream/custard. Add the potato cubes and buttered leeks to serve. I love this recipe for lots of reasons: it’s Deja Food, it’s comfort food, is simple, cheap, quick to put together and it’s deliciously tasty. I’ve included a couple of twists in this seemingly simple recipe that elevates it into something really special. The pastry is a new version of shortcrust that I have adapted from a Victorian bakers’ book. It includes cornflour, which makes the pastry extra crispy, which isn’t always easy with an all-butter pastry, and it has a really smooth, dry feel which makes it very easy to handle. I’ve thrown in some rosemary to pump up the flavour in the pastry, and the filling is simplicity itself – just diced, cooked potatoes and cheese – but with a secret ingredient that makes these pies completely awesome. I like chutney. I’ve always liked the sharpness from the vinegar, the spiciness, the touch of sweetness – and I’ve made my fair share of them too. The secret to a good chutney is time – leaving it for two to three months after it’s made so that the flavours can develop and the throat-catching harshness of the vinegar can mellow. Taste it too soon and everything is much too strong. Which brings me to the secret ingredient: Sainsbury’s Basics Tomato Chutney. Now, you know I love you, Sainsbury’s, but you’re just not aging your Basics chutney, are you? Pop that jar open and whoosh! The whiff of vinegar and spice is mighty powerful. However, if you bake a little of this chutney into these pies something magic happens: all the harshness of the vinegar disappears and just add a piquancy that breaks up the pastry/cheese/potato combo. Don’t worry if you don’t live near a Sainsbury’s – Basics Tomato Chutney seems to be a staple in most of the major supermarkets. 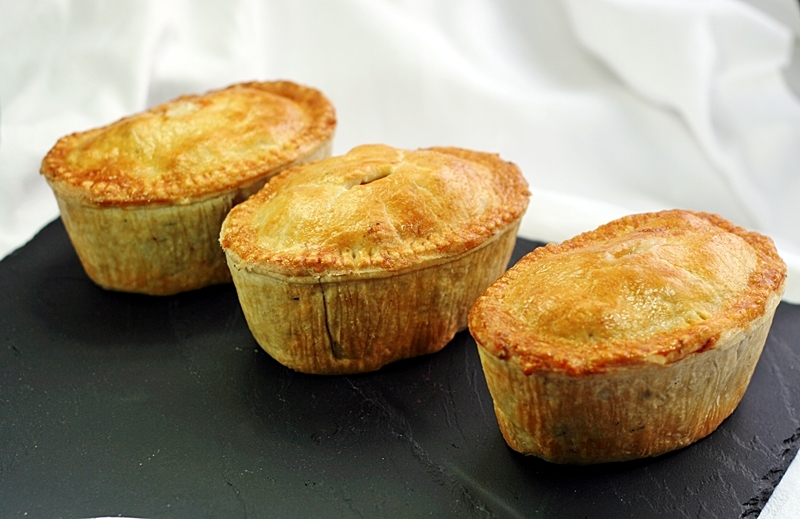 These pies are great for packed lunches and picnics or just a quick and comforting lunch at home. Put the flours, rosemary and butter into the bowl of a food processor and blitz until the mixture resembles breadcrumbs. Tip the mixture onto a floured surface, knead smooth then wrap in clingfilm and chill for 30 minutes. Cut the potatoes into centimetre cubes and put into a bowl. Add grated cheese to your taste and season with salt and pepper. Remove the pastry from the fridge and cut off two thirds. Roll this piece out thinly to a thickness of 3-4mm and line your greased pie dishes, making sure there is enough pastry over the sides of the dishes to allow for joining the lid. Put a layer of cheese and potato into the bottom of each pie shell. Add 2-3 teaspoons of tomato chutney and spread into a thin layer. Roll out the pastry for the lids. Wet the undersides with a pastry brush dipped in waterand press them onto the tops of the pies firmly. Trim off the excess pastry with the back of a knife. Crimp the pastry edges by pressing into them with the tines of a fork. Wash over the tops of the pies with beaten egg and cut a small hole in the pastry lids to let out steam. Bake for 25-30 minutes, depending on the size and shape of your pies, until the pastry is crisp and golden.